The Poetry Post, a cedar pole, stands in Vashon town’s Village Green. 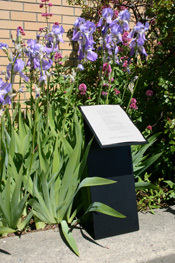 The post is modeled after Yakima’s Poetry Pole, stewarded by Jim Bodeen of Blue Begonia Press. The Vashon Post was erected in 2006. Ann Spiers and Zack Krieger led the effort. Loren Sinner Cedar donated the 10-foot clear cedar post. Vashon Parks and the Village Green stewards granted permission for its planting in public space. Bill Ferris’s Raven’s Isle Woodworks carved the letters. Bill Mann drove his tractor carrying the post and augured the hole. The late poet Paul Motoyoshi offered a tea ceremony as a blessing for the Post in the gloaming at the moment of the Winter Solstice 2006. If you’re willing to subject your poetry — or your favorites — to public scrutiny, weather and yellow jackets, Ann welcomes poems from all over. You don’t have to be an Islander. Pin up your own or send them in an email to Ann Spiers at spiers@centurytel.net.